Rustic Cabins on Banks Peninsula. Summer cabins available so get in touch for exact dates. email littlerivercamp@ Please don't rely on the dates here for bookings, as we are not very good at updating them. You need to email us directly. Relax under the 100 year old walnut trees or find a private picnic area. 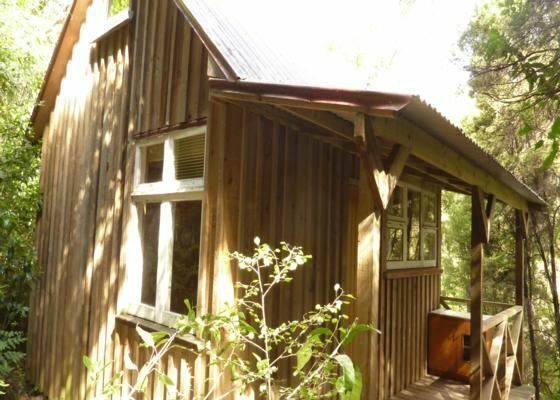 The Love Shack is a perfect hide away close to Christchurch. Hidden in native bush beside the Okuti River you can escape the rat race for $75 (for up to 3 people/night). The Kowhai cabin is part of The Little River Campground in Okuti Valley, a sheltered spot close to Christchurch and Akaroa. Sleeps up to 8- from $110 for four. The campground has three cabins including 'Kowhai' our family sized cabin and 'The Love Shack' suitable for a couple but can sleep a family as well as powered and campsites all set next to the Okuti River. If Kowhai is booked we may well have something else available, so please get in touch. The kids you will love the in-ground trampoline and water slides. There is also a small stream to play in and 5 hectares of native bush with walks from 10 minutes to one hour. The Manaia Native Habitat is part of the property and is covered in native trees such as Totara and Matai and a mighty 450 year old Kaihikatea (White Pine). Wake to the dawn chorus of bellbirds, shining cuckoo, wood pigeons and fantails, to name a few. Known as 'The Gateway' to Banks Peninsula Little River has something for everyone. Rail trail, beaches, cafes, art gallery and craft station. Travel time is only 45 minutes from Christchurch City and you do not need to go over any hills to get here- so if the kids are complaining, 'are we there yet? ', you can say, YES. We are 4 kms to the Little River Rail Trail, 30 minutes to Akaroa and 20 minutes to Tumbledown Bay, a safe, clean, sheltered beach. Magnet Bay is one of the best surf spots and is 20mins from the campground. To be discussed at time of bookings. Dogs allowed on agreement with management. Slippery slides, swimming hole, rail trial, beaches, cafes, art gallery, surfing, walks, MTBing.